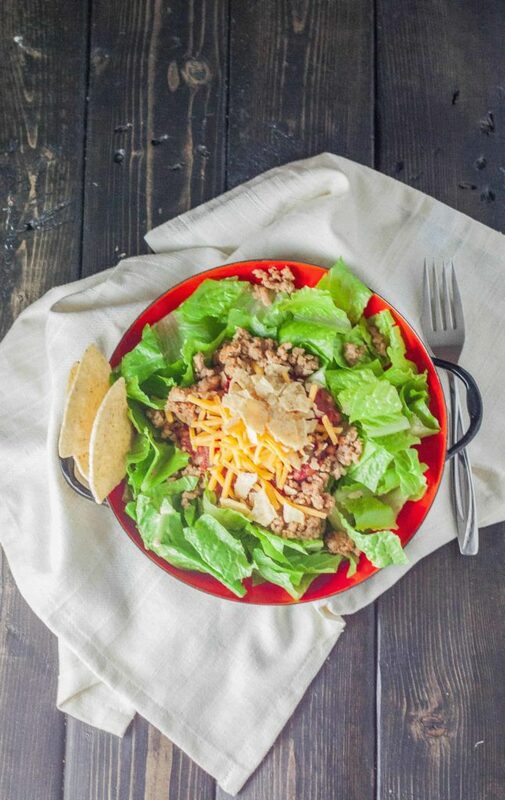 Bring on the fresh greens, veggies and dressing, today I’m talking 5 ingredient turkey taco salads and 27 salads I need in my life! Lately I’ve been craving ALL THE SALAD! It started when I was making yogurt lemon chicken salad for dinner and just so happened to be photographed for an article in the paper. 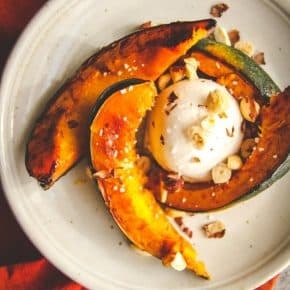 I was pleasantly surprised at how much I enjoyed the salad and how quick it was to make. Then I shared my recipe for steak caprese salad and a cool trick for how to dress a salad. So needless to say, I’m totally loving salads but am a little embarrassed to admit that while I actually really do love salads, I don’t make them nearly enough. Pour 1/2 cup salsa in a large frying pan and add in the ground turkey and cook it, breaking it up as you cook it. Cook for 15 minutes, or until the turkey is cooked through. In a large bowl (or 4 small bowls) divide out the lettuce. When turkey is done cooking spoon out on top of salad, pour remaining salsa on top of ground turkey, then add the cheese and tortilla chips (I like to crush some of the tortilla chips as I add them on top of the salad). 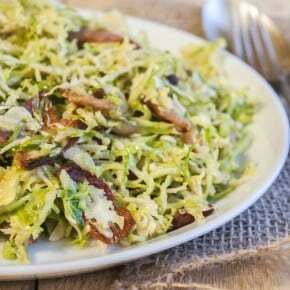 Mix the salad and enjoy! If making this salad for eating at a later time just cook the ground turkey and salsa and store it in an air tight container in the fridge until ready to use. Alternatively you could use slow cooker salsa chicken as a topping (just put salsa and chicken in a crock pot on low for 6 hours and then shred when done). Did you make that salad in a colander? Genius idea for a picture! I love simple salads like this – not a ton of ingredients but a ton of flavor. I also love the recipe list you compiled – so helpful to have everything in one place! Simple salads are my favorite kind too…if I’m wanting something quick and easy I don’t want to spend hours making it, you know? That bowl the salad is in is actually from an antique store, it’s not a colander, although now that you said that i looked at it and it totally looks like one lol! Thank you, as always for your lovely comment! I had to include you in the list girl, that steak and asparagus salad? Yes, that I need in my life 🙂 Love you! Taco salads are my jam. I eat them all the time, and tell myself that the presence of lettuce and tomatoes makes it healthy despite the large number of tortilla chips that I pile on top….ha. 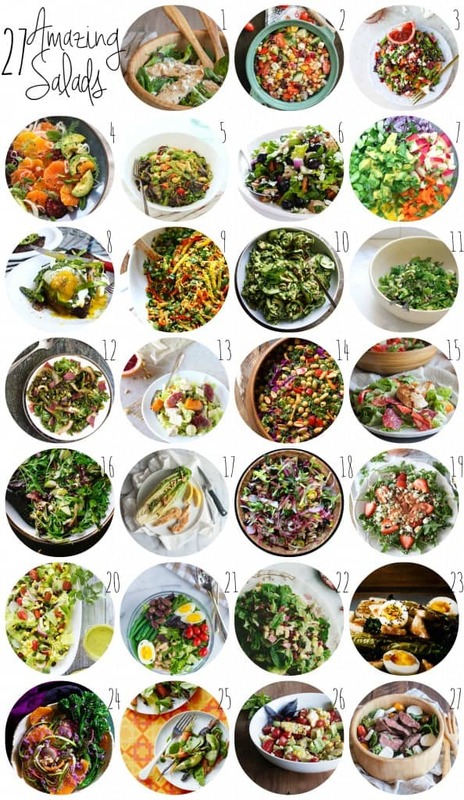 Pinning this great list of salads!!! This is such a great idea! Love that you used turkey! Thank you so much Amanda! 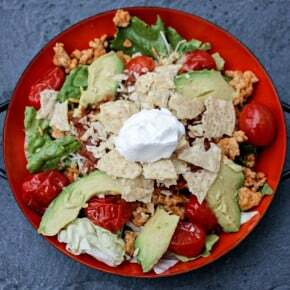 I love turkey for this turkey taco salad, it also makes me feel healthier as I eat alllll the chips with it lol!